We run a non-profit organization. Curious, related to Requisite Organization, what differences between not-for-profit and a profit organization. 1. Profit is called surplus. 2. The entity doesn’t pay taxes, or pass through taxes. 3. No person “owns” the entity. 4. Governance is achieved through a board of directors, which, in turn, hires the CEO. While it is a fair question, the contrast in RO between for-profit and non-profit is minimal. The technical name for most of Elliott’s research is a Management Accountability Hierarchy (MAH). It’s purpose is to get work done. There are larger contrasts between entities organized for purposes other than getting work done. There are differences between an MAH and a religious organization, a political organization, a family unit, a collegial organization, a fraternity, a sports team. 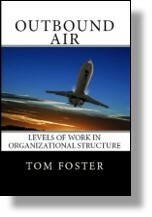 Organizations are not necessarily designed for the purpose of completing work. And, there, is where you might see larger differences in accountability and authority related to problem solving and decision making. This entry was posted in Organization Structure and tagged for-profit, non-profit, organizational structure, requisite organization on December 15, 2014 by Tom Foster.